At USO-Metro, we have numbers; 300,000 military and family members living in our geographic service area. 150,000 traveling through our airports every year. 754,415 instances of service at our 10 centers and various programs. We have numbers, and we aim to make them the best numbers possible, but we know that it is not the numbers that are most important. What is most important are each of the stories that make up those numbers. 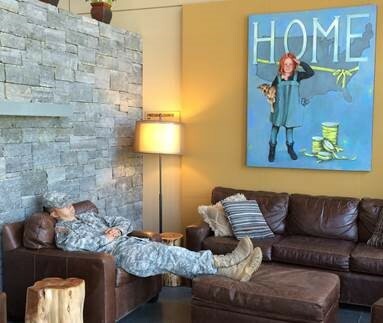 Snacks: $700 - Lightbulbs: €517 - Providing this Soldier with a place to relax? Priceless. - Love what we do. Even the simple moments count. Our Field Operations department created spectacular events for 10,155 military and family members. Among them, a world-famous s'mores maker who received a Turkeys for Troops box on November 19, 2015. On October 1, 2015, USO-Metro opened its tenth location at the Baltimore MEPS facility, located on Fort George G. Meade. Military Entrance Processing (MEPS) has the unique and challenging mission of determining the physical, mental and moral qualifications of new members of the armed services. The Baltimore MEPS is the fifth busiest in the country, processing anywhere from 40 to 120 potential service members each day while also serving as a waiting area for family, friends and dependents to witness the oath of enlistment ceremony. The Baltimore MEPS and its multitude of visitors cannot thank USO-Metro enough for the wonderful addition to our station. It will be enjoyed by thousands each year and will set the initial stage in each applicant’s and family member’s mind about the support and strength provided by the USO worldwide,” remarked Lt. Col. Megan Stallings, commander of the 12th Battalion, U.S. Military Entrance Processing Command and Baltimore MEPS. “Thank you for embracing the future Soldiers, Sailors, Airmen, Marines and Coastguardsmen as they embark on their journey. From the time the candidates first walk in, to after they’ve signed their contract, the volunteers see these young men and women become Soldiers, Sailors, Airmen and Marines,“ commented Melyssa Haubenstricker, center supervisor. "It is a humbling experience, and our volunteers treat each recruit, family member and guest with the utmost respect knowing the sacrifice these recruits have sworn a willingness to make. 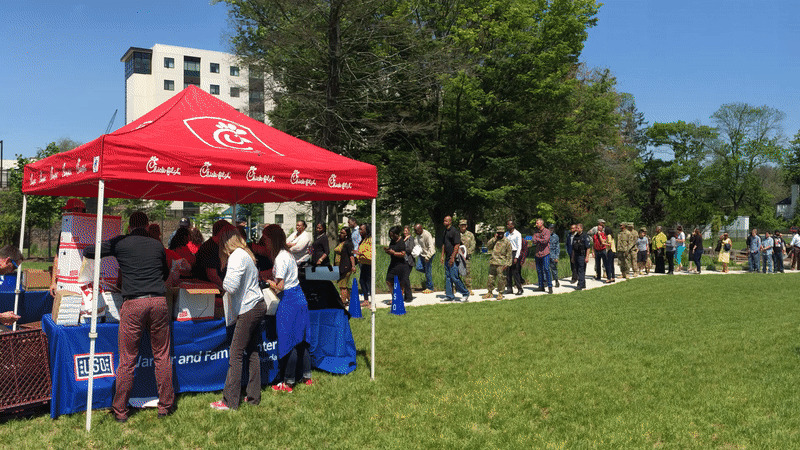 In support of their Military Appreciation week Chick fil-A brought their distinctive red food truck to Naval Support Activity Bethesda. On a gorgeous May afternoon over 2,500 original chicken sandwiches were prepared and distributed to grateful service members. A special guest appearance by the Chick fil-A cow – and Miss America – added some star power to the event. Can you say yum? They are already strong, but together, they are stronger. Hosted by the USO of Metropolitan Washington-Baltimore and the Project Cinderella Planning Committee, and sponsored by EY, Project Cinderella is a special event that empowers military women and spouses to embrace their authentic beauty by providing them with a variety of interactive workshops (such as Beauty on a Budget, Financially Savvy Women, and Formal Etiquette and Protocol), special speakers, and a visit to the Dress Boutique to select a “new-to-you” formal gown and accessories. Throughout the day, attendees got the opportunity to network with 150 other military ladies and special guests. Ladies leave the event armed not only with some new fashion pieces, but also with fresh empowerment, increased confidence, new skills, and a broader network of friends within the military community!